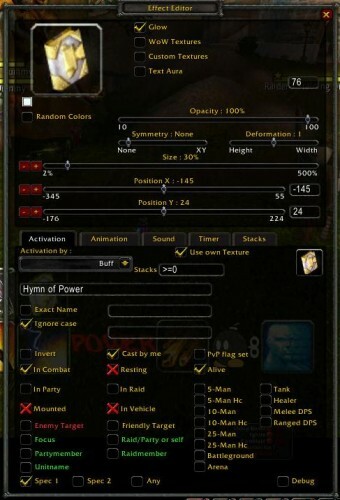 Anyone who has been playing WoW for any length of time has heard someone say at some point “I love power auras”. Well guess what, I love power auras. 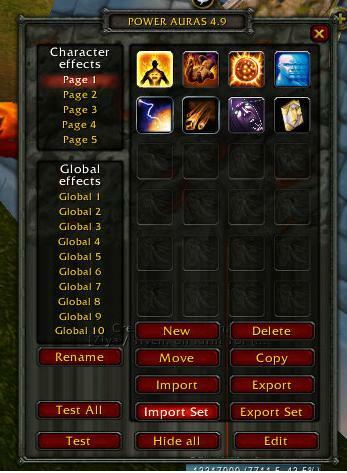 I want to spell out how I have my power auras set up for my fire spec, but in the process give you a step by step guide on how to set up power auras for almost anything you will need as a mage. Give a mage a power aura and he’ll top DPS in an instance, teach a mage how to use power auras and he’ll top DPS for life. So you downloaded power auras and loaded up wow. Type /powa and you should get a screen like this. The first time out you should have no power auras so you will select New. After you set one up you’ll have icons like I have here and any changes will be done with the edit button. 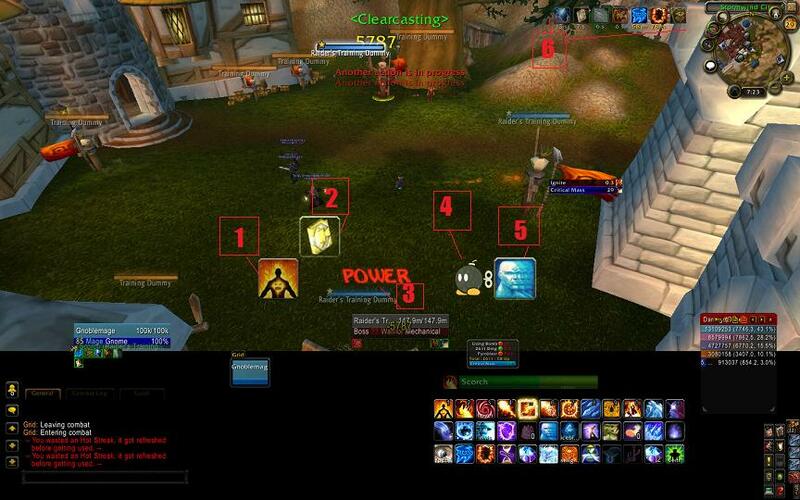 For a Fire mage there are 3 types of Auras you need to know how to set up. Buffs, Debuffs, and Spell Cooldowns. It is important to correctly identify what type of effect you want to highlight to make Auras work. As far as debuffs there are two you want to track. The first is Living Bomb. The second is Critical Mass. To maximize DPS potential on Living Bomb it is important NOT to clip your DoT. That means if it is going to finish in 2 seconds, don’t reapply until it is finished. 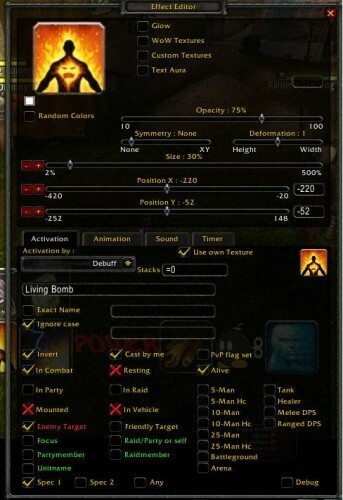 If you do you miss out on significant DPS from the Living Bomb’s explosion. Ability Name: This is the field below Activation and Stacks. It needs to match the name of the ability exactly. Try and match how it is Capitalized if you can. Invert: Check this field. This setup will only show you the icon if your target is missing the debuff. I don’t really care if Living Bomb is on the target, I only care when Living Bomb is not on the target. Cast By Me: Check this for Living Bomb, but you can skip it on Critical Mass. The reason is you can have multiple Living Bombs (if you have other fire mages), but there can only be one Critical Mass. If you are running with a Destruction Lock you can tell her you have the 5% Crit bonus against target debuff covered. She will be relieved that she can slack on Shadow bolts. You will be using Scorch enough this should be up most if not all the fight. In Combat+Alive: Check both because we don’t care about debuffs out of combat and if we are dead. Mounted, Resting, In Vehicle: Click til they are Xs. we don’t care about Auras in those situations. Note though that in the Camel Boss in Halls of Origination if you ride the camel your Power Auras will not work because you are in a vehicle. Enemy Target: Click this. Again we don’t care if your team mates have these debuffs. Now like I said above you will be using these for the debuffs Living Bomb and Critical Mass. The way these are configured they will only show up if the debuff is missing from the target. If they are on the target already you should be casting other things anyway. One of the core mechanics of Mage in any spec is to respond to Procs. For Fire Mages this means knowing when you get an instant and mana free Pyroblast. But there are other procs you should be looking out for as well. Here is my Power Aura for knowing when Hot Streak is up giving me the instant Pyroblast. Invert: Unchecked because we want to see when it is active and have it gone when it is not. Enemy Target: Unchecked because this buff is on you not the target. Now you should be using this for Pyroblast and Impact. However it is important to know when you need to respond to Impact. It will stun the target which is generally fine, but it will also spread DoTs to nearby targets. If crowd control is nearby you want to be very careful about using impact. It is important to remember that just because an Aura is displayed doesn’t mean you should respond to it. It is simply a nice notification that you now have that option. 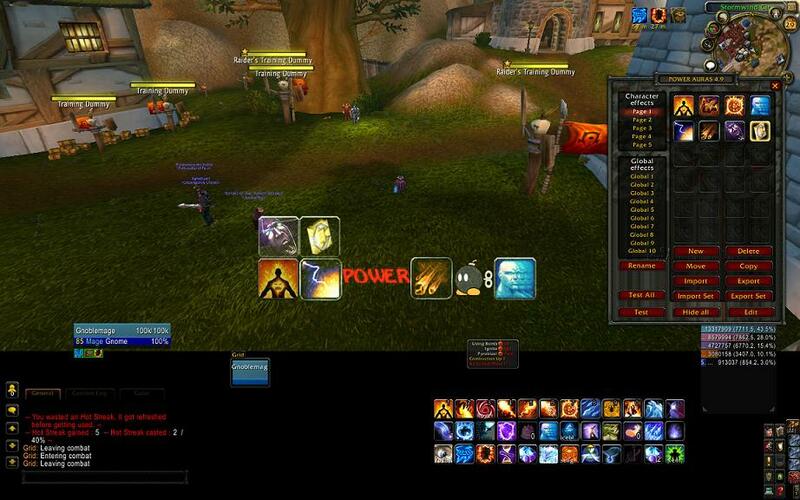 Another use of the buff style of Power Auras is to know when your trinkets are proccing. I currently have Sorrowsong and Anhuur’s Hymnal . When these proc I get 1512 spellpower for 10 seconds. In order to maximize DPS when I get that boost I want to go from a hover rotation to a burn rotation if I am not doing so already. So I have my trinket’s buffs show up when they proc. As you can see it is almost identical to the Hot Streak notification. To get the name of the buff you can go to the target dummies and just cast spells until they proc. Keep an eye on your buff bar closely and when they come up mouse over for the name. It is important to match the name exactly. Some spells are use everytime off of cooldown. Flame Orb is a prime example of this. In a boss fight where there is no CC of adds you should be firing and forgetting Flame Orb every chance you get. Here is my aura for that. A quick note about Combustion. The optimal use of Combustion requires a combination of effects on the mob, and therefore should be saved until Ignite, Living bomb and Pyroblast are all on the target. Power Auras (at least to my knowledge) is incapable of making multiple condition Auras. Luckily there is an addon to help. Check out CombustionHelper. So now you have the Auras all set up, and if you didn’t mess with the top section (icon, position, opacity etc) they are a jumbled mess on your screen. Let’s clean that up some. Go back to the main menu. Click on the “Test All” button. Now all your Auras should be on your screen at once. Click on one of your auras and click the Edit button. Now adjust the size, X position, Y position, and opacity until they are on your screen as you like them. Here is how mine looks after I got everything sized and spaced right. I set it up so I have the top row being my trinket buff notifications, and the bottom row are the Auras based on spells I use. From left to right they are Top Row: Sorrowsong then the Hymnal Trinket. Bottom Row: Living Bomb, Critical Mass, Pyroblast, Impact, Flame Orb, Mirror Image. So let’s see how that translates into combat. I started spamming scorch and saw this. So let’s see what my Auras are telling me. My target doesn’t have Living Bomb currently and I should apply it ASAP. My trinket is proccing for 1512 spellpower and I should be in a burn phase (fireballs for filler and no scorches). We can verify this by the presence of the same icon in my buffs seen in area 6. My Hot Streak has procced and I should cast Pyroblast immediately. 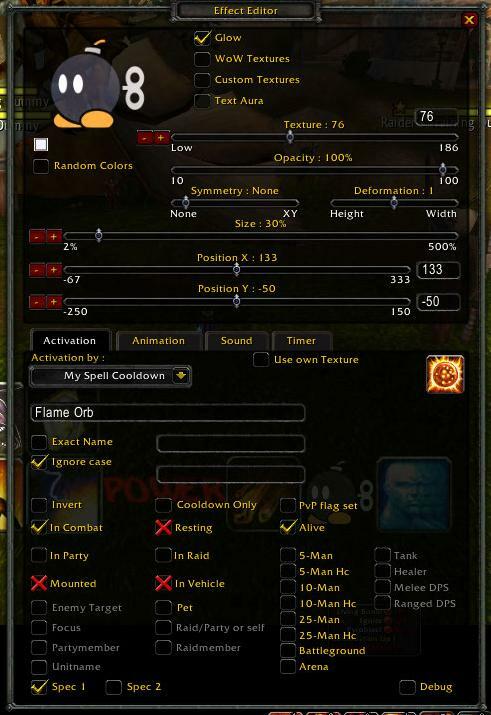 We can verify this by looking for the fiery hand icon in my buffs in area 6. Flame Orb is off cooldown and I can use it. Mirror Images is off cooldown and I can use it if I want. Now these are just the ones I use. Some people also like to put up buff reminders for things like Molten Armor or Arcane Intellect. Do you know TellMeWhen? It’s like PowerAuras, but I find it easier to setup and have a ‘cleaner’ config panel. 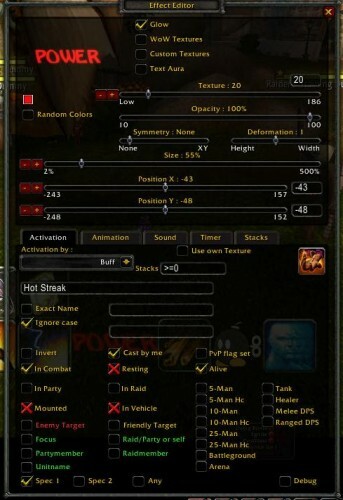 There is a lot of possible setups, like the one I found myself obligated to use: Pyroblast debuff have two names (at least before 4.0.6, when I last played my fire mage): “Pyroblast” for normal pyros and “Pyroblast!” for proc ones. So I created 2 icons (one for each Pyro debuff) with 0 opacity, and a third to show if one of them was active. So maybe, MAYBE, give it a try. Thank you for all your awesome topics, and excuse me for my english, it’s not my primary language. I have used tellmewhen, and I really do like it. It is far more intuitive to set up. The reason why I switched to POWA is because there was a good chunk of time when Tellmewhen wasn’t being updated and it just stopped working. By the time it was working again, I had already gotten my POWA set up like I like them. There are definitely multiple ways to do things. However, if you are daunted by the powa configuration menu, I would encourage you to give Tellmewhen a try. Actually something I’ve toyed with in the last few days (since I wrote this) was to have a few small red dots lined up under my main row (it is also right next to combustion helper). If I see 4 dots then it is time to use combustion. I still have combustion helper at the moment though just like training wheels for the moment. I recently just made a power aura for combustion exactly like this the other day. I have three icons pop up all with timer for each of the three DoTs I want to combustion on. Next I have a combustion aura on spell cooldown, with all three of these DoT auras as a condition (enter aura number in the bar next to Exact Name separated by slashes). So if I have all three DoTs up and if combustion isn’t on CD, this aura icon pops up. SUPER helpful. Between the two of you, is there anything you don’t know? Hunters. They smell like pee. I hear rogues use something sharp and pointy. I have not been able to confirm this yet. Also DKs. How the F*** do they work? Bwahahaha. I accept your conditions. Typically the decision on when to go from burn to hover is decided by a few things. First if your trinkets are proccing for the spell power boost you should be in burn mode, and if the target is less than 35% (thus making your molten fury talent in play) you should be in buirn mode. Heroism/timewarp/bloodlust however is a toss up. I tend to go into burn mode myself, but EJ says it by itself isn’t necessarily a boost. I also tend to save Time Warp if I can till the target is under 25% since so many specs get a DPS boost at that point. The biggest advantage of the hover rotation is that you are just not going through your mana at nearly the clip you do in burn rotation so it is like treading water. And until the boss is dead it is probably a good idea to keep some mana in the gas tank. So I’ll start off in a burn rotation and switch to a hover when I hit 50% and only go into burn mode if one of the burn conditions above is in play, or I manage to get above 75% mana again. Sinc eI’m glyphed for evocate to heal that sometimes happens when I’m trying to just get myself healed up in a crunch. Hopefully that helps some. You can in fact make conditional auras! 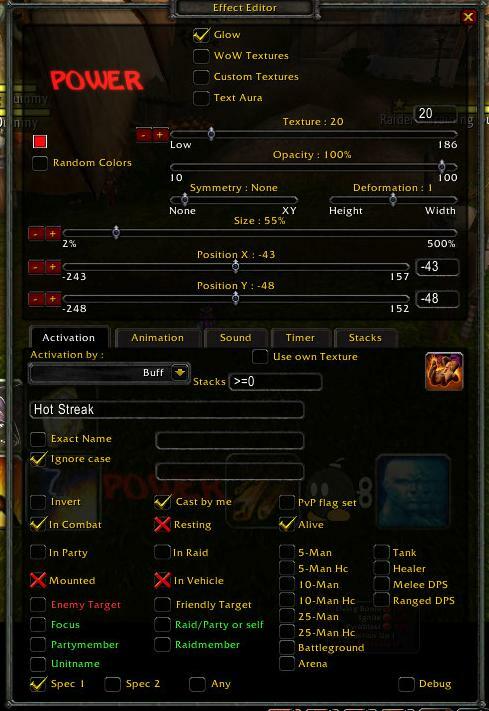 Create auras that you would like to track, but make their icons as invisible as possible (make them small and low opacity). Then create a master aura to track everything.